Overview -- LG's 65-inch C9 OLED 4K TV offers perfect blacks, infinite contrast, great viewing angles, HDMI 2.1 capabilities, and wide color gamut playback, along with support for HDR10, Dolby Vision, HLG, and Technicolor Advanced HDR formats. But while there are a few key new features and processing improvements over the company's 2018 C8 model, general picture quality remains very similar to last year's lineup. Of course, that's not a bad thing at all. In fact, LG's 2019 OLED is a genuine stunner and looks poised to cement itself as one of the very best 4K HDR TVs on the market. Budget conscious buyers might be better off snagging a cheaper 2018 OLED model while they can, but for users who want a more future-proof HDMI 2.1 capable display, the C9 is Highly Recommended. 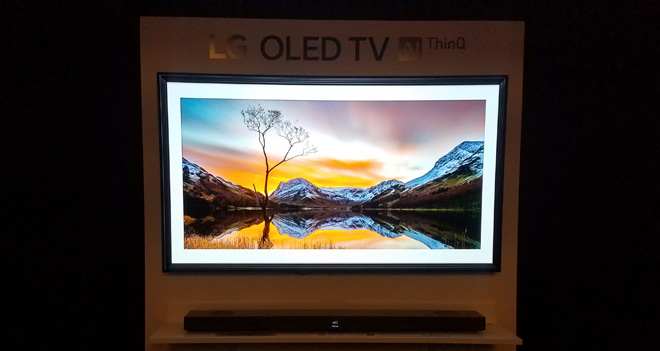 High-Def Digest was recently invited to attend a special demo event for LG's new 2019 4K TV lineup. As part of the showcase, we got to go hands-on with the C9 65-Inch OLED Ultra HD TV, offering an extended look at the display's features, along with side-by-side comparisons to several competing TV models. Though a complete in-depth review will have to wait until we can get a bit more time with the display, we're back with some initial impressions based on what we've been able to see so far. And what we've seen has only left us wanting more. The 65-inch C9 features a 4K Ultra HD OLED panel with support for Dolby Vision, HDR10, HLG, and Technocolor Advanced, along with an HDR Dynamic Tone Mapping Pro option and close to 100% P3 wide color gamut coverage. 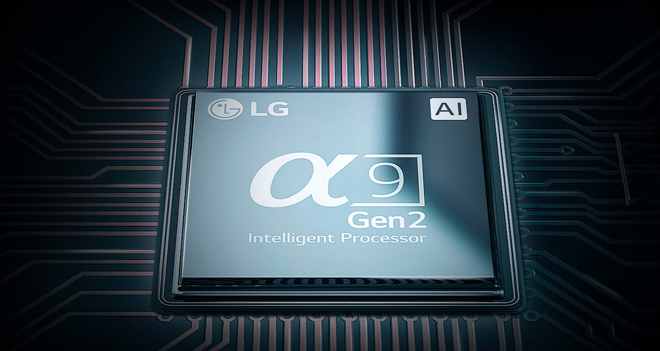 Under the hood, the display is powered by LG's new Alpha 9 Gen 2 Processor with deep learning algorithm, allowing the TV to optimize picture and sound quality based on the source content being played, along with the ability to adjust its tone mapping curve and screen brightness to better match ambient lighting conditions in a user's room. Likewise, Dolby's latest imaging innovations allow the TV to intelligently configure Dolby Vision content for varying ambient light as well. 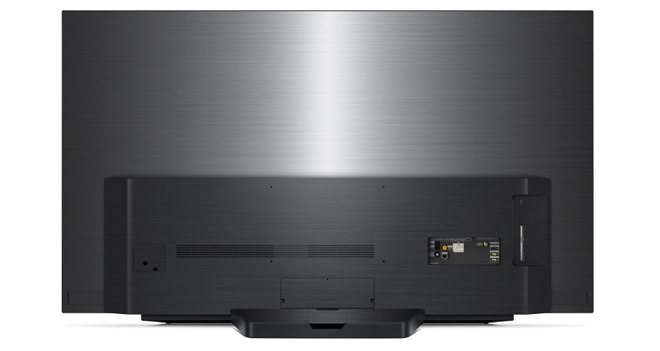 And beyond video, the C9 also includes Dolby Atmos support and the ability to up-mix two-channel audio to virtual 5.1 surround sound via the TV's integrated 2.2 Channel 40W (20W Woofer) speaker system. 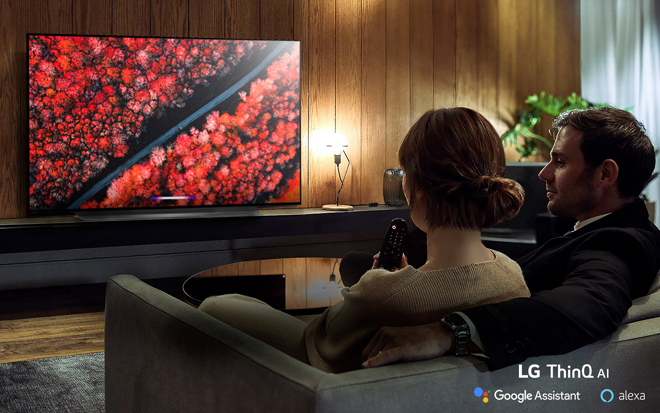 Meanwhile, when it comes to AI services and smart TV functionality, the C9 uses LG's ThinQ and webOS platform with access to a variety of apps, along with built-in Google Assistant functionality and newly added support for Amazon Alexa. A Magic Remote is included as well with support for navigation by pointing and tilting the controller at the screen, as well as voice commands. Finally, four HDMI 2.1 ports are also implemented, offering support for high frame rate (HFR) 120 fps playback, enhanced audio return channel (eARC), and gaming features like variable refresh rate (VRR) and an automatic low latency mode (ALLM). With that said, select HDMI 2.1 features will require a future firmware update to operate. 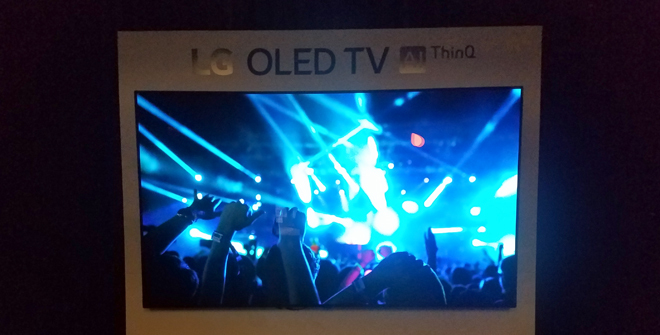 For the first demo, LG spotlighted some of the C9's improvements in highlight brightness and detail, pitting the display against a competing Sony OLED and last year's LG C8 OLED. All of the TVs were placed in their default out-of-the-box Standard or Cinema modes for comparison. Though the panel itself essentially remains the same between all three TVs, updated processing and tone mapping capabilities on the C9 have indeed produced a small yet still appreciable upgrade in apparent HDR luminance. The first clip featured a snowy mountain scene with lots of white across the screen. While all of the TV's looked quite impressive, the C9 did indeed demonstrate a slightly punchier look in highlights, making the whites pop just a tad more than the other sets without introducing any notable clipping. A second clip from The Revenant also revealed a similar performance advantage, resulting in slightly better shadow detail in characters' faces and more prominent specular highlights in the sky and background elements. Moving on to other processing benefits, the next demo was designed to showcase how the C9 handles background artifacts. A clip featuring a space launch was played on all three TVs using their lowest noise reduction setting. While artifacts like noise and false contouring were visible in the smoky background on all of the displays, the C9 did demonstrate a smoother look in several shots. To be honest, however, I found this to be one of the most subtle comparisons and, while some minor noise reduction can be beneficial for lower quality content, I typically prefer to keep settings like this off anyway. Switching gears to demo the C9's new AI deep learning optimization feature, all of the displays were placed in their Vivid modes while a colorful underwater reef scene was played on the TVs. Using the AI feature, the C9 automatically adjusted its picture to suit the content, creating a slightly brighter image. With that said, it's hard to really say that it made the image look "better," and I'd have to see the AI option sampled on more content to really make any kind of firm judgement on its benefits. To cap off the side-by-side OLED comparison, one final clip was played to demonstrate the C9's handling of fine detail in motion. A clip of a scrolling sculpture with tightly packed patterns of detail was shown. Out of the three sets, the C9 offered the smoothest and cleanest image while the Sony OLED revealed some shimmering as the fine textures panned across the screen. As a whole, though occasionally fairly subtle, the C9 did offer improvements in HDR highlight performance and processing throughout the OLED head-to-head. With that said, outside of a direct side-by-side comparison, I'm not sure if the picture enhancements here really provide that much of a demonstrable upgrade over a 2018 OLED -- which is really more of a testament to how good LG's models have been over the last few years than a criticism of the C9 itself. 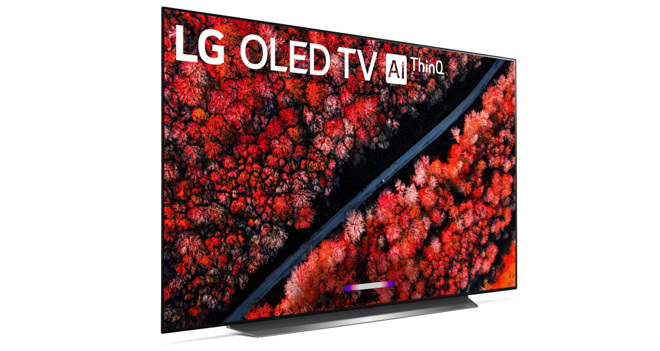 While LG is supporting 8K this year with a flagship OLED and NanoCell LCD model of its own, the company remains more committed to the concept of "better pixels" rather than simply more pixels. With that in mind, another 65-inch head-to-head was set up -- this time placing the C9 OLED against one of last year's 4K Samsung LCD TVs (I believe either a Q8 or Q9) and Samsung's new 8K LCD TV. Again, for the majority of the demo material, all of the TVs were placed in their default Cinema or Movie modes. The first clip featured a scene from Disney/Pixar's Coco filled with dazzling colors. And while the sequence looked rather lovely on all three sets, it was quite difficult to discern any notable benefits in detail on the 8K TV. In fact, it was not initially revealed which TV was the 8K display, and I honestly found it very hard to tell which LCD was 4K or 8K during the clip. With that said, I've seen other head-to-heads with Samsung's 8K TV where a difference between 4K and upscaled 8K was more discernable -- but those demos featured the company's larger 85-inch model rather than the 65-inch version used here. As one might expect, the benefits of 8K upscaling seem to diminish at screens this size. Though there was no clear winner when it came to overall detail, the OLED TV did offer superior contrast and black levels thanks to its emissive display. The LCDs looked very solid in their own right from a direct viewing angle as well thanks to their full array local dimming, but off-angle viewing caused a rather big drop in contrast, uniformity, and color. Meanwhile, the OLED retained its inkiness and saturation from the side. To further showcase the advantages of the OLED's pixel-level contrast, a clip featuring a moving starfield was shown on the screen. Dark content with very tiny bright objects like this typically prove to be challenging for local dimming LCDs since there just aren't enough zones to handle the level of precision needed. As such, the 4K and 8K LCD had major issues here, causing the screens to dim in large sections, making most of the stars invisible. On the other hand, each and every moving star was visible on the OLED while maintaining perfect black levels. Another torture-test clip was also demoed, this time featuring an animation with butterflies around a pot of flowers. The combination of visual elements caused some rather extreme false contouring, uneven backlighting, and other artifacts to appear on the LCDs while the OLED handled it all without any major issues. I doubt anything this extreme would ever crop up on the LCDs during normal viewing conditions with traditional content, however. Finally, outside of specific demos designed to highlight certain aspects of the TV, I also got to sample several scenes from a variety of 4K HDR movies, including La La Land, Life of Pi, and Avengers: Infinity War. In general, the 4K OLED looked stunning with all of the material, resulting in a gorgeous, inky picture with sumptuous colors. And though the LCDs could get a bit brighter, and I noticed some minor crush in a few shots on the LG, the OLED's deeper, more precise blacks led to a more impressive sense of overall contrast, helping to make the C9 the overall picture quality winner of the three sets. Beyond picture features, LG also offered a brief demo of the TV's Deep Learning Sound feature. This option is designed to automatically analyze the content being played to optimize the sound output and up-mix it to virtual surround sound through the TV's integrated speakers. To highlight the tech, the company first played back a scene featuring a stampede. Toggling AI Sound on did indeed create a fuller soundscape, adding a bit more oomph to the charging animals, though the improvements were not exactly night and day. An additional scene with DJ music resulted in a similar expansion and another demo with football players talking in a huddle made speech a bit more intelligible. With that said, even with the AI enhancement the TV's speakers are still pretty limited compared to a separate sound bar or surround sound system. The feature does seem to make the most out of the display's integrated sound while doing a nice job of prioritizing dialogue for those who find conversations hard to hear in some programs -- but I just don't see it as a primary selling point. We'll need more time with the unit to offer a full review, but based on what I've seen so far, LG's 65-inch C9 OLED 4K TV could very well become one of the year's top displays. With that said, though there are some processing improvements, overall picture quality does not seem substantially different from last year's OLED models. Compared to the currently discounted 2018 C8, the more expensive C9's main draws appear to be its new AI Deep Learning optimization features and HDMI 2.1 ports. The deep learning tech for video and audio did prove to be intriguing during my demo time, but I'll need to test it out a bit more before I can say whether it's worth the extra cost. Meanwhile, I didn't get to see any HDMI 2.1 features in action, but users who want a more future-proof and gaming friendly display might find that to be reason enough to invest in this new model. And while some competing LCD displays can offer greater peak HDR brightness, the pixel-level contrast of the C9's OLED display is hard to beat -- no matter how many local dimming zones an LED comes packed with. Of course, it should be noted that burn-in is still a risk for OLED panels, though the display comes with several settings designed to reduce that possibility. Bottom Line: Based on initial impressions, LG's C9 OLED is an absolutely stunning 4K TV with some intriguing new features -- though its overall picture quality appears to be very similar to last year's C8. If HDMI 2.1 isn't a factor for you, then I'd recommend snagging a cheaper C8 before stock runs out. Otherwise, the C9 is Highly Recommended.